Love This Torrid Floral Skirt! Seems appropriate doesn’t it? And I will wear a pair of sandals but I like the boot look too! I usually buy mini skirts, (this one is 21 inches) because then they generally fall just below my knee. This is the same sock hack I used a few weeks ago (thus the green sock photo). I had some pink socks that I hoped would peek out of the boot, just to add a little matching color to the outfit, but they were way too bulky to wear under my boots. Great thin socks are always a struggle in plus sizes. So I cut the foot off of them and wore them like short leg warmers, since all I really cared about was adding a little color to the bottom half of my legs (I will wear the foot portion to sleep in so no waste here). I wish I had worn bright pink earrings to bring the same color up to my face. I suspect you will see the sock hack fairly often. Affatshionista’s 5 Posts You Loved the Most in 2014! I just want to close out 2014 with a review of the posts you loved the most on Affatshionista this year. Over the course of the year, more than 90,000 readers visited our site. So what were the most popular posts of 2014? 5 Stores That Have Extra Wide Calf Boots! 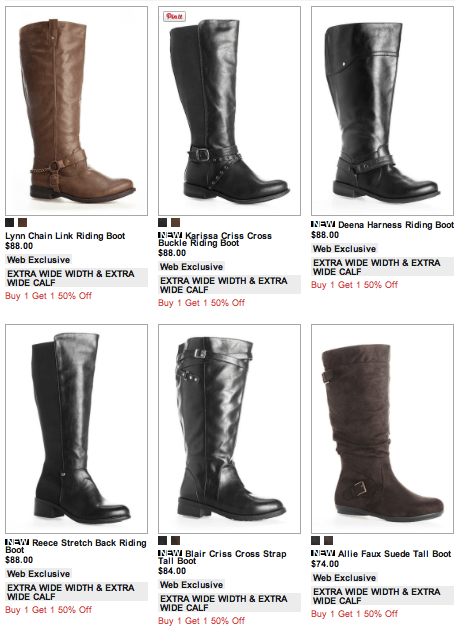 I get searches on this blog everyday about boots. We love boots. They are everywhere. Every plus size blogger is putting together their list of their favorites. So I went on the hunt for the widest calf boots I could find. 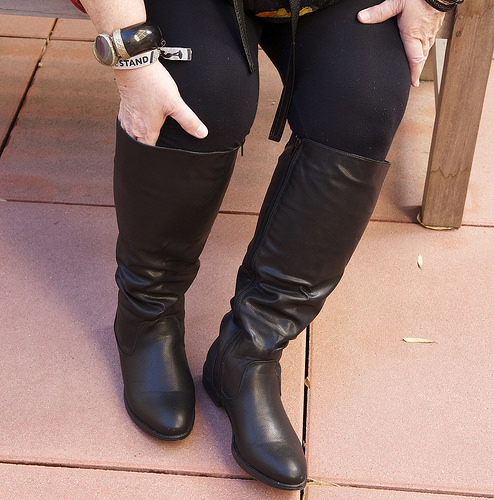 I did not have to go very far, Simply Be has 21 pairs of what they call “Extra Curvy Plus” Wide Calf Boots. I believe this boot is the widest calf boot they carry. That means for a Size 10 the calf width is 23 1/4 inches. I know it is difficult to consider ordering boots from England, in case you have to return them, but OMG, 23 1/4 inches. Be sure to check their sizing chart to make sure you order the best size for you, and I love their reviews. And to check out their version of the elastic panel boot, which might even fit a little larger, click HERE! Let’s just see if we can do any better than that? 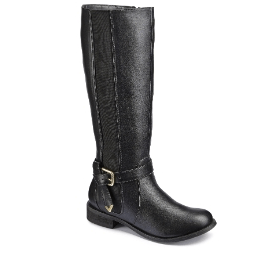 Wide Widths carries 12 super plus wide calf boots. 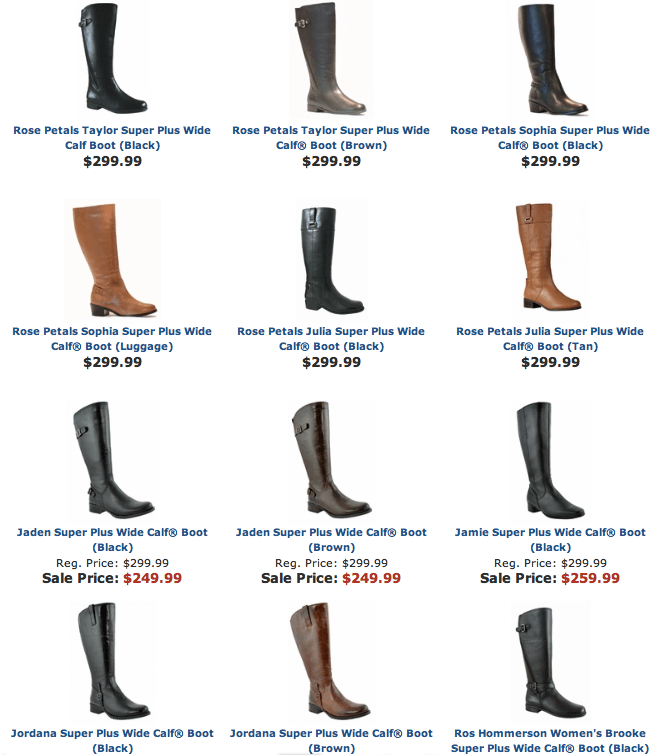 That means the calf width is 24 3/4 inches for a size 13WW, which seems about the same as the Simply Be boots above. Avenue has always been my go-to for boots. They are reasonably priced and I can often go to a store and try them on, but I am more of an apple shape and my calves fit fine in their widest calf of 19 inches. But they also have a boot with a STRETCH CALF BACK PANEL that might increase the calf width a lot, check it out HERE. We will continue on the search. 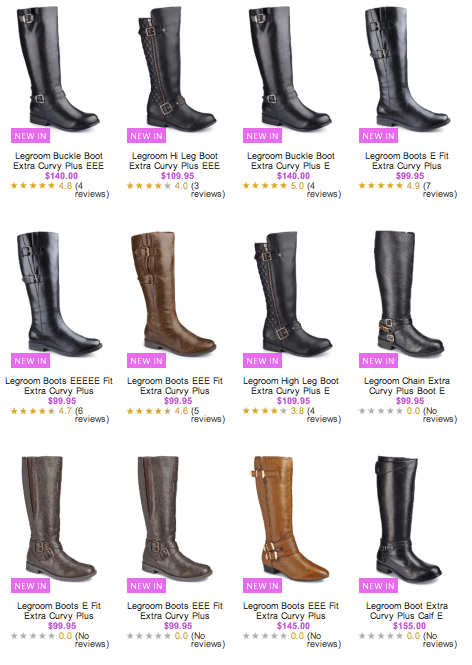 Jessica London has nine Comforview Brand of wide calf boots. For the Size 10 boots their calf sizes are also 19 inches. Duo actually has multiple calf widths…I’m not sure what they are in inches because I’m too lazy to do math, but they come in 2-centimeter increments up to (I think) 50 cm? And I believe you can order whatever calf width you want in whatever size you want. The website says that the calf widths over 45 also have a little wider width in the foot. I bought a pair on clearance and they’re lovely. They were still more than I’ve ever spent on shoes, but they’re beautiful and they fit like a glove. The shaft of a boot has centered lines running up the middle of the front, back, and each side. Sometimes it’s a seam or a zipper, sometimes not. If you’re going to add a section of leather to expand the circumference, the most appropriate place to add it is in the rear of the shaft. If you add it to one side or the other, the shaft twists and the rear seam will be crooked. I know we’re always searching for wide calf boots, so i just wanted to post my new boots from DUO! i was kind of worried about fit because my calves are outside the highest measurements (49-50cm) but i was surprised to find that this pair (Flore) they have small elastic gussets. duo customer service is also incredibly helpful–I sent them an email prior to purchasing and they responded quickly and with very useful info. (they mentioned that Beaumont would fit a 51-52 cm calf!) i can’t speak about any other pairs, but Flore fits my 20-21″ calves very easily, and i imagine that they’ll stretch with wear because they’re leather. they’re gorgeous black leather and i looooooooove them. They are expensive, but I got them during their black Friday sale and they are also having a sale right now. From Facebook: If you have the budget for it & want a really great quality pair of boots check out Boots for Broads; I believe its an Australian company and they custom make the boot to your exact foot & calf size. I’ve heard nothing but great reviews although I’ve never been able to spend the money to get my own. If you have the $$ to spend its definitely worth it, good luck! 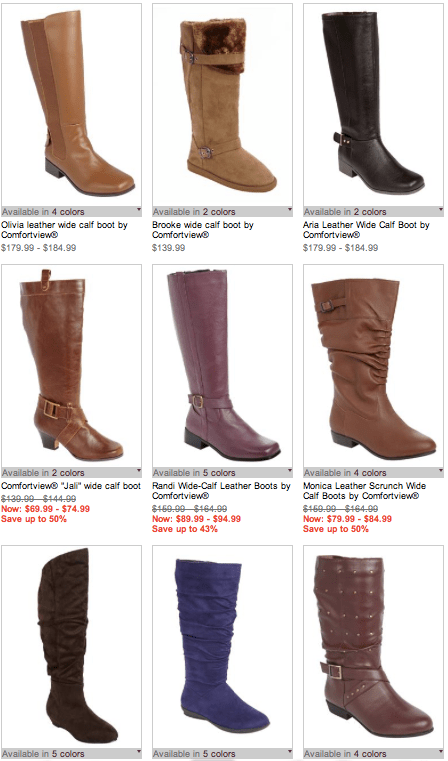 There are some great choices here, I would love to hear from you if you know of other extra wide calf boots! 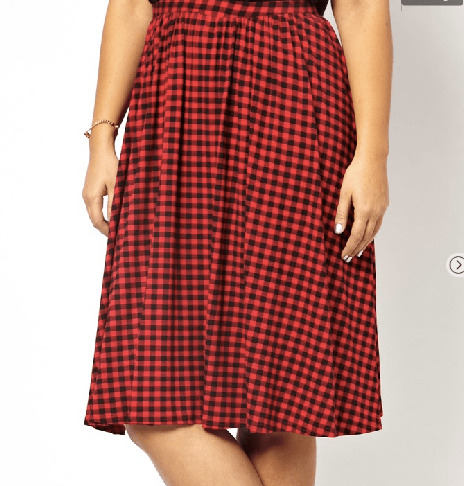 What was I thinking, a midi skirt for me? So what did I do? 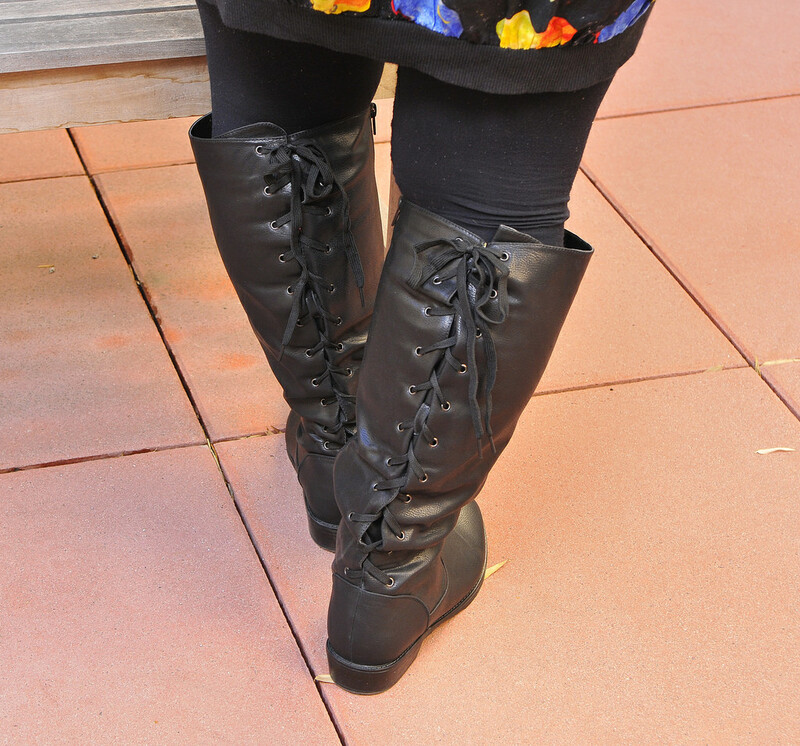 I immediately rolled it up so it looked like a regular skater skirt, and wore it with stockings and boots! The definition of a skater skirt is: high-waisted, short and flowy with a hemline that hits above the knee. This is what the midi skirt looked like on the 5’10” tall model. I should have known that a midi would look draggy on me. LOL! 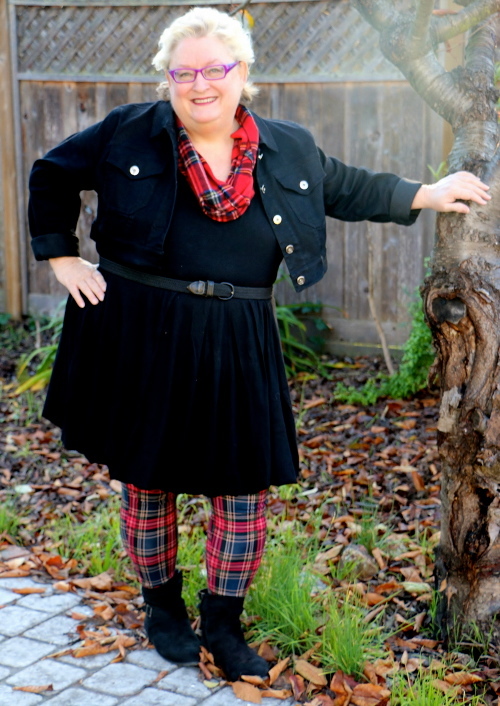 This skirt, via Gwynnie Bee, is a U. S. Size 24, to compare my measurements to yours, to see if these clothes might fit, click HERE. As you may know from this review, I have a membership to Gwynnie Bee, and if you are interested in trying it FREE for 30 Day please read more HERE. Full disclosure: if you sign up after the free month, I get a month free. I just cannot decide whether or not to keep this dress. Clearly it needs to be shortened, but I fits comfortably, it is made of light fabric and it is really fun. I bought it on sale so it is not that expensive, maybe without the belt and a better bra… BUT the real question is will I wear it? All those dresses I have that are easy to wear, and fun and flirty, this is sort of dramatic and VERY revealing. I would love to hear your opinion. And I suspect I am leaning toward sending it back since this is the only time I have worn it. 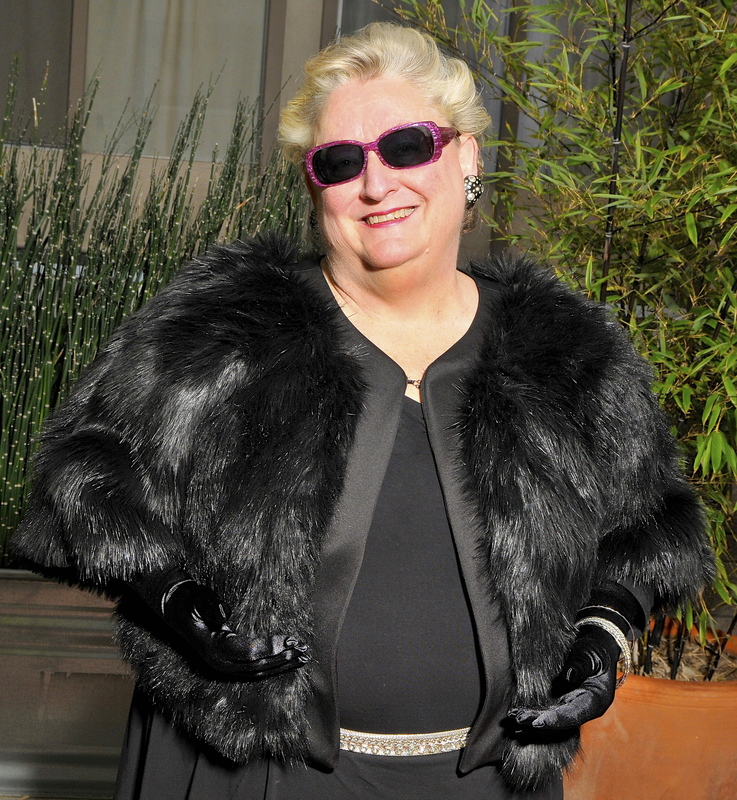 To compare my measurements to yours, to see if these clothes might fit, click HERE. Avenue Size 9.5W Boots, my review is HERE, and they are currently on sale. As you know from this review, I have a trial membership to Gwynnie Bee, and if you are interested in checking it out please read more HERE (full disclosure: if you sign up after the trial, I get a free month free). One of the first dresses I tried was this one, because I love the body con look, but because I am apple shaped I thought it would not be a great look for me, and “renting” the look seemed perfect. This dress looks great standing up forward, although it could use a little shortening, but both standing sideway and sitting down it is not as forgiving as a fit & flare dress, which is how I usually dress. I am thrilled to have tried it and I would love to hear about your body con adventures. You can see my measurements HERE if you want to know how this might fit YOU. The Size US 24 was a very comfortable fit for me. 12/10/13 Update: The red and black dress above has turned out to be my favorite of the ASOS Curve Body Con dresses I have tried on, and FYI it is on sale right now, HERE. I like the weight of the dress, I like the black panels, I may have to buy it. 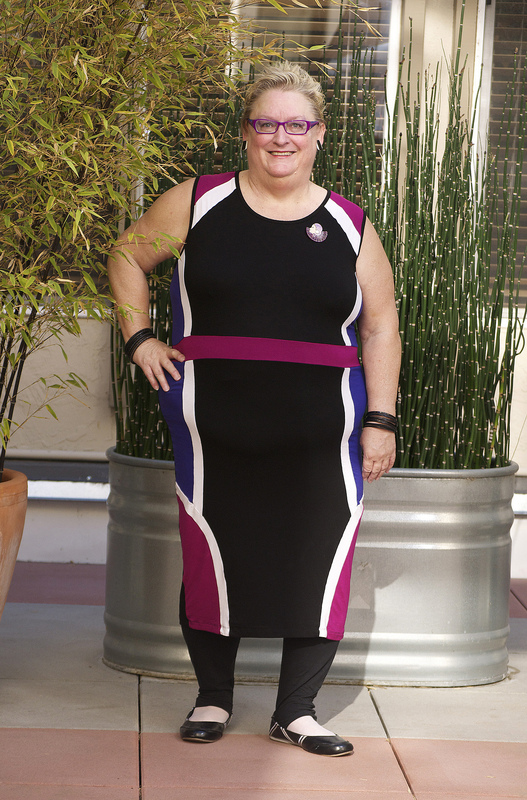 I also tried another ASOS Curve Body Con Dress, which I had been coveting for months, via Gwynnie Bee, and once again I loved it, although it was much longer and would need to be shortened, and because it was a much lighter material, it did not do well with the leggings. 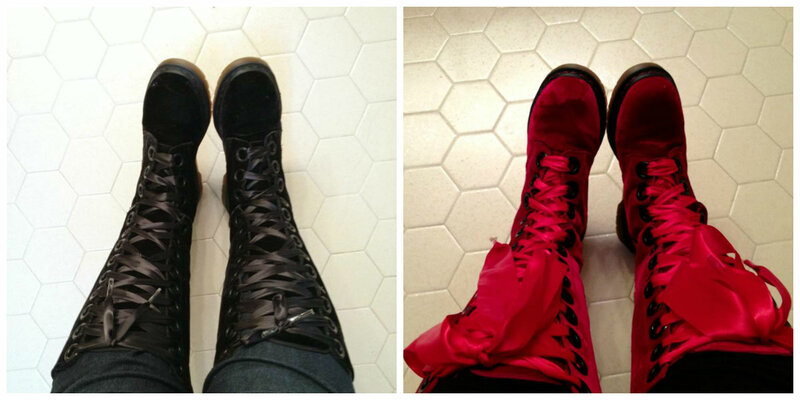 My calf is about 19″ and these are the ONLY long Doc Marten boots that have EVER kind-of fit my calves. Kind-of, in that I had to do some modifications to make them work. If I wanted to actually lace them all the way up I had to replace the previous ribbon laces with longer ones (I keep forgetting to get even longer ribbons for these so I can have the poofy bow like I do with my red ones). Also, there is a little bit of gapping between the tongue and the grommets. With the black ones it doesn’t matter much as I have only worn them with dark pants so far but with my red ones I duct taped a strip of the wide ribbon on each side of the tongues so the gap wasn’t noticeable. In my experience Docs run wide (I’ve had and have a lot of them over the years, lol) and these are no different, I don’t wear wides but I need to wear chunky orthotic inserts with Docs and there is enough room for those without pinching my feet. You might be able to find a pair of these on ebay or FatToo Acessora but I also thought these might work with a little stretching. 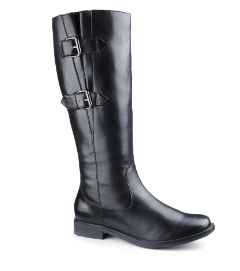 In my size they run about $150, and good wide calf boots run about $300+, so I may give this a try. Thanks Cherie for sharing your secrets with us.